First of all, for those who do not know, these are Limited Edition. 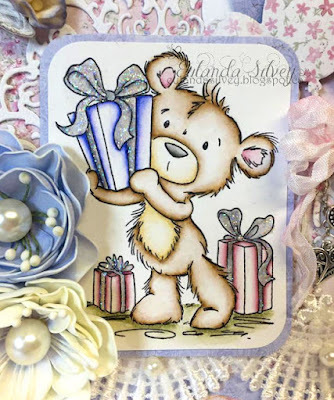 It is a collection assembled by Tracy, who tries to source ALL NEW items each month, focusing on her favourite things. If there are any left over these go into the store, and if not just those that purchase the kit will receive. Each month is a different theme . Don't miss out, hop on over HERE to order your kit. Doesn't that sound fabulous! There is also an additional facility using Paypal monthly subscription links. So, onto what I made. 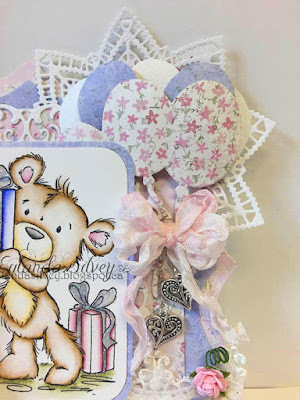 Today I am sharing a card using the Crafteezee Elegant Ladies' Collection and selected other things from from the shop at http://www.noordesign-shop.co.uk/ plus items from my own stash. 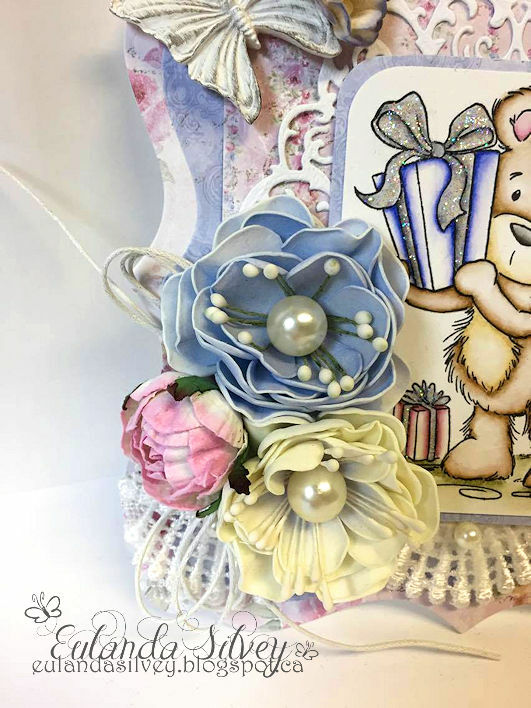 So, from the 'Elegant Ladies' Collection I used the gorgeous Maja papers, the lace which can be seen at the top of the card and the beautiful bronze flower which forms the central piece. This is sitting on a Scrapinec frame, layered with cheesecloth which are both from the shop, as is the lovely pearl button which is placed in the centre of the flower. I used a mixture of Joy and Fantasy dies. Here we can see that I used two colours of the seam binding with the lovely nib added on top. I used White and Antique Brown. Look at this gorgeous bronze flower! The Beautiful papers by from Pion Design's "The Songbird's Secret", all links as usual at the bottom of the post. Below is a close up of the flowers. The leaves were cut by hand and the texture createed using the Moulds, also linked below. I added some Scrapiniec Meheni Laces. It's Friday and it's again my turn to share some inspiration with you! I think that it's perfect as a paper holder. I love it!!!! 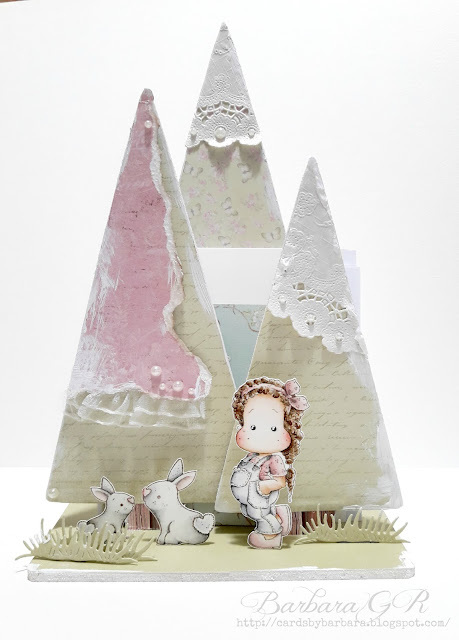 Design papers used are from Pion Design - Where The Roses Grow collection and the pink one from Maja Design Sofiero collection. 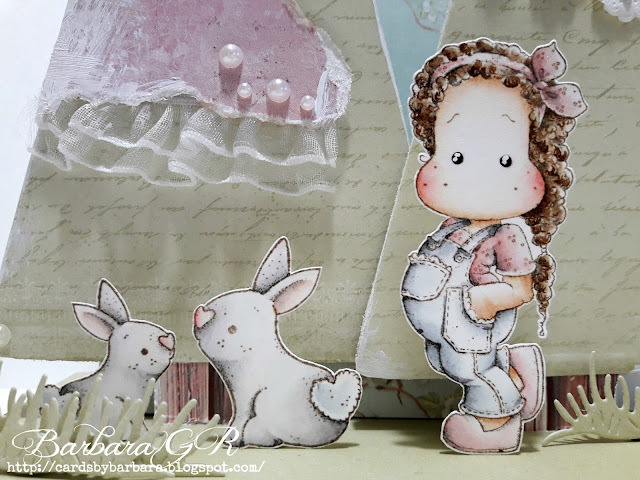 These cute Jeans Tilda and Bunnies are from the newest Easter box collection and from Spring Time collection available for pre-order and order at Noor! Design U.K. shop. The image is coloured with distress Inks. I just LOVE the look of pastels and distress inks so for this card I put them together with Maja's newly released Sofiero papers. 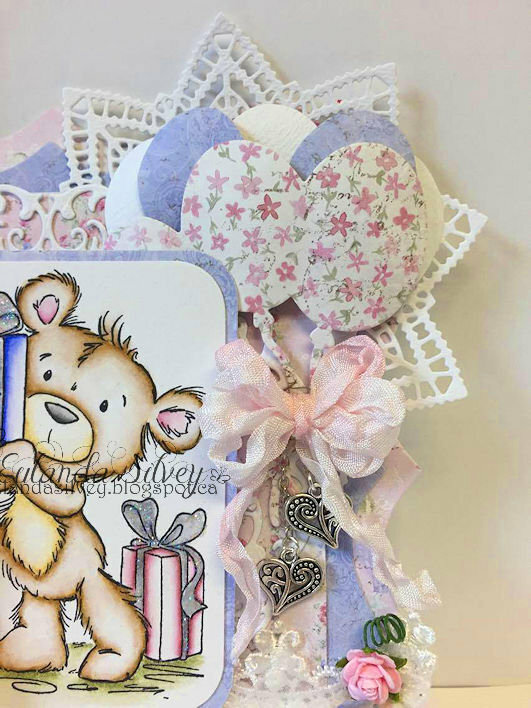 I cut my shaped card and then started layering all my dies. I know I've said it before but I'll say it again, that Marinne doily die cuts so beautifully it's just effortless when all the cut pieces fall away from it. I also used Joy's "Let's Party Balloon's" and behind the image is Joy's "Oval Frame". That one has always been one of my favorite's. How sweet is that bear?!!! That's Milton with Gifts from Wild Rose Studio and you might be able to tell that I added some glitter to all the bows on the gifts. Loved coloring this with my distress inks, so cute! I tied a shabby bow and hung a couple of heart swirl charms from the bow. I've made a couple of Rosy Owl Foamiran flowers and after adding my stamens plopped a big fat pearl right in the center that I had in my stash from a costume necklace my sister had but never wore. ha ha ha! I put a wax cord bow under another WOC english rose flower. Well I hope you like my fuzzy cuddly bear card! Again, if you find something you like that's out of stock just send an email to Tracy and she might be able to help you. Dreamlander - Always got your back. Dutch Doobadoo MDF Bunny Napkin holder.